Photography. Limited edition 10 pcs. Print on the cotton Fine Art paper, 1400×900 mm (1200×700 mm without passepartout). Every day we receive a huge amount of information from the world in an already prepared, interpreted form. We don’t have to analysis and take own conclusion. Later, when quoting opinions obtained from the media in conversations, we present as ours although they are not. We don’t verify, we don’t check. This is how we perceive the possibility of developing our own opinion and, consequently, our own development. We are also becoming an easy target for community that want to manipulate us. 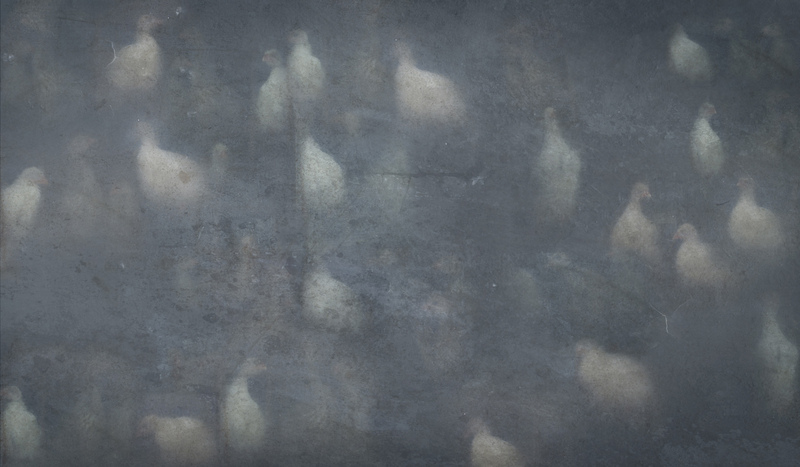 The artwork presents chickens huddled together in groups, in grey behind a glass. Is that how we look?